We've heard from multiple sources that Twitter is likely to have a big-time partner for such a service: Apple. Specifically, we're hearing that Apple's new iOS 5 will come with an option to share images to Twitter baked into the OS. 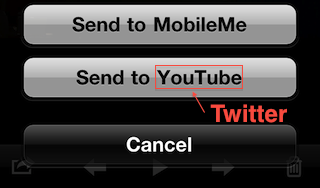 This would be similar to the way you can currently share videos on YouTube with one click in iOS. Obviously, a user would have to enable this feature by logging in with their Twitter credentials in iOS. There would then be a "Send to Twitter" option for pictures stored on your device. Twitter is said to be offering their own photo-sharing service in the near future. Apple will be detailing iOS 5 during WWDC next week. Apple needs to integrate a better photo app where we can actually organize photos, first. I think that instead of baking it directly into iOS they should make an API where you can register your service with the phone, just like you can with QuickLook now, and have the photos app pull that up as an option. It could be the same exact implementation as "Open In" that you see with PDFs and other docs but make it a "Share With" button. Am I the only one who simply couldn't give a toss about Twitter? How about in addition to "Send to Twitter", why not include "Send to Facebook" or even go as far as "Send To All" and in the settings you can assign the different Social mediums to "Send it All"
Twitter and Facebook are only as bad as you use them to be. It's how you use Twitter which matters. I use Twitter to speak with developers, news anchors, news stations. I don't interact with them because I like them or anything. I use it to be informed about a huge variety of topics, daily. I use it to share news with close friends and family. The potential is amazing, don't be blinded by the tweens who speak with celebs or tweet about how they just woke up from sleep and don't know if they should brush their teeth or not. Twitter is a very valuable resource for education and information, if you're following the right people or organizations on Twitter. I learned about this news post because i'm follow MacRumors on twitter! Otherwise i wouldn't have visited this site until WWDC. Mind you, i'm barely on Facebook anyway. If you have the Twitter app installed on your BlackBerry, the "send to twitter" option becomes available right in the camera app. It is EXTREMELY convenient, so it would be great if it came to iOS. God how i hate all this social BS. Like there are no other pressing matters to attend. ...said a man on a social message board. You are so reaching here and you know it very well. What you said, what I said, and what you said are all the exact same thing as tweets. Funny, I am the complete opposite. Most of the pro's (in my field) I follow just have auto-updating spambots posting constant updates. That and every time I get @ replies from someone "famous" I just end up with 20 more spam tweets I have to manually block. Facebook on the other hand allows me to keep regular contact with friends, family and colleagues all over the globe. I'm the opposite because I find Facebook useless since you need to "friend" people you already know before you can really do anything with them. Twitter, on the other hand, is useful constantly. I was going to an attraction on Sunday that I knew would be busy. (And was an hour drive away.) I searched and found someone on Twitter who had tweeted about being in the line. I asked him how long it was and he told me "about 30 minutes." So I felt safe that it wouldn't be a super-long line and I decided to go. Google can't tell me that. My aunt on Facebook can't tell me that. E-Mail can't do that. Twitter is an incredibly useful tool for learning real-time information that no one else has. How people can dislike that sort of utility really does confuse me. I've always said that Facebook is for liking people you know and Twitter is for hoping that total strangers like you. I think people's personalities go one way or the other. If you hate public speaking or making a scene in public then you're probably more into Facebook. If you want to be a stand-up comedian or are someone who talks to strangers all day long then Twitter's probably more your thing. I meet a lot of people who really like one or the other. Very few are in equally in love with both. Yeah, honestly I probably would be all over Twitter if it came out in my formative years. But all I had back then were message boards so here I am.